Ah, it’s that time again. 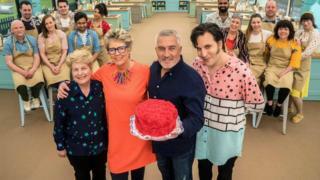 Great British Bake Off is back next week, easing us into those cooler autumn evenings with talk of proving, the gingham altar and, of course, soggy bottoms. This time we can relax – following last year’s controversial move to Channel 4 from the BBC, our worst fears weren’t realised. 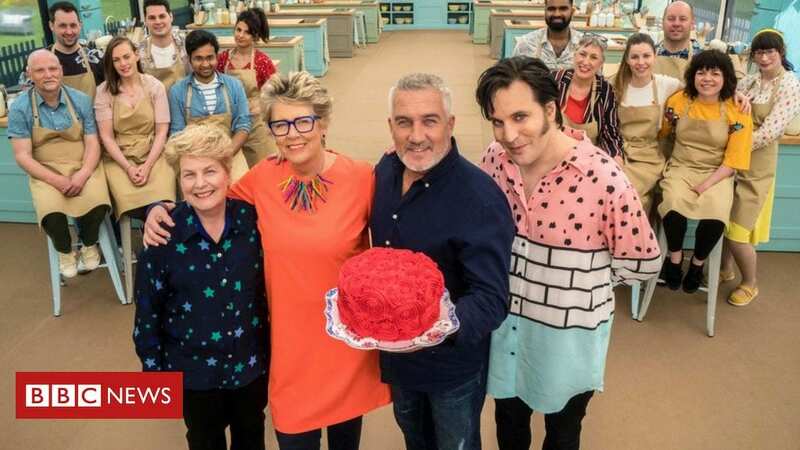 Sandi Toksvig and Noel Fielding had more chemistry than Heston Blumenthal’s egg and bacon ice cream and Prue proved a fine replacement for her baking pal Mary Berry. 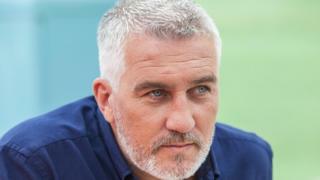 And ol’ blue eyes, aka Paul Hollywood, was there to steady the ship. 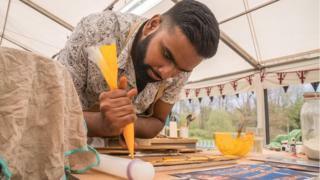 This year, the Bake Off team are trying something new – having previously experimented with gluten-free bakes, the forthcoming series will feature a vegan week. “Veganism seems to be growing and we wanted to represent that,” Paul tells the BBC. But there won’t be any allowances for the lack of eggs and dairy. “You can’t just say: ‘It’s okay for vegan [food].’ It has to taste good, period,” Paul explains. So creme “pate” and Genoese sponge are very much still on the menu. Image caption Prue and social media – like a split mixture? 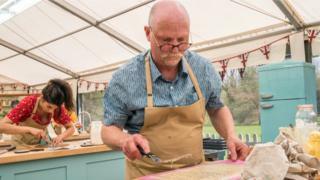 Here are 13 – that’s a baker’s dozen, don’t you know – other things we learned about the new series (we don’t give too much away but if you really want to steer clear of any Bake Off revelations ahead of the first show, look away now). How could we forget the moment when Prue tweeted the name of last year’s winner before the final had aired? Well, let’s just say they don’t shy away from the unfortunate event in the first episode’s opening scene. In fact, it’s pretty prominent. We don’t want to spoil the surprise but Prue and Noel ARE in costume and if you like classic 80s movies, you won’t be disappointed. Prue is now comfortable with her tweeting controversy. “I’ll know I’m a has-been when people stop telling me not to tweet,” she jokes. Prue was “hugely relieved” the first series was a success. 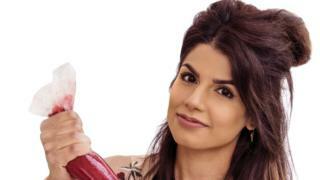 The culinary entrepreneur admits she’s very comfortable bathing in the GBBO spotlight. Every year, pretty much without fail, there’s at least one episode where the heat in the tent causes serious baking issues. Chocolate and butter start melting under the pressure, along with the contestants. But surely this year’s long-running heatwave proved more troublesome than usual? “There were a couple of challenges where the weather came into effect,” Paul admits but he’s not giving anything else away. Sorry. It’s not just vegan week that’s new this year – there will also be a Danish week. Mmm, we’re thinking berries, apple, cinnamon and custard. Not necessarily in that order. Rahul – a nuclear research scientist no less. Who can’t stop talking. Paul can’t get a word in edgeways. Neither can Sandy. And he has a lovely “chubby little face”. Paul’s words, not ours. Antony – could be this year’s Selasi. Laid back, funny and cool as a cucumber. Unlike the temperature in the tent during this year’s heatwave. Manon – she’s French. Therefore, brilliant at baking. Obviously. And calls Wagon Wheels Wheelie Wagons. Too cute. Terry – elder statesman (ok, so he’s only 56) with an amazing moustache. Former air steward and prosthetic technician who has his own microbrewery. We’re hooked already. Moreover, he’s the only one to use a 3D technique in the first technical challenge. Terry, we salute you. 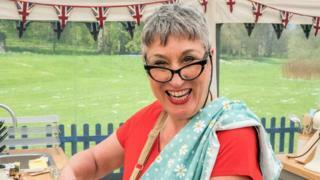 Karen – Yorkshire lass who Paul describes as a cross between Su Pollard and Dame Edna (ok, that’s how he describes her signature bake but it is a self-portrait). Laugh-out-loud moment of the first episode? Don’t miss Kim-Joy’s classic take on Dan’s big biscuit. That’s all we’re saying. And if you’re worried there’s not quite enough innuendo in episode one, Prue tells us: “Don’t worry, you’ll get some.” (Fnarr fnarr). Paul suggests there should be an outtakes show post-11pm for the really rude stuff – we NEED that commission! 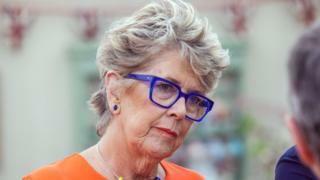 Sadly for us, Prue says she’s “learning to be discreet” after Tweetgate. Which means she won’t reveal what tricks Noel plays on her and Paul off camera: “I’m not going to say them in public!” But Paul says he and Noel’s “humour is very similar”. Frightening. Noel serenades Prue regularly with his own special version of Chris Isaac’s Wicked Game: “I never dreamed that I’d love somebody like Prue.” Who knew? 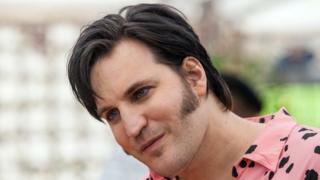 He’s also seen sporting an Elvis-inspired hair-do in episode one. And Paul says we’ll see quite a few changes to Noel’s barnet as the weeks go by. They usually eat (and drink!) together after a shoot. And they have a WhatsApp chat group. We want to join. “Sandi and Noel are really funny and exactly the same off set as on,” says Prue, to our relief. Master baker Paul Hollywood says they ARE biscuits although sadly, he “can’t quite fit them” in his tea for a dunk. A biscuit selfie. Yep, you heard that right. Bit gimmicky but who cares? So what would Paul’s selfie biccie look like? Prue suggests he’d be on a motorbike and would “have a squashy middle”. Ouch. But Paul doesn’t entirely disagree: “Crispy and hard on the outside, a little bit soft on the inside.” Bless. Prue says she likes to try things out herself – well, it’s only fair. “I quite often bake it [the technical challenge] the week before so I know what I’m talking about. A lot of these things – it’s years since I baked them. And then I quite often bake things after the show, I will get the recipes [from the contestants]. Paul kindly puts the onus on us: “People should challenge themselves at home, put the timer on, bake it and put it on Twitter.” Paul, you make it sound so simple. The Great British Bake Off returns to Channel 4 on Tuesday 28 August at 8pm.